College campuses are hot spots for getting sick. According to Dr. James Turner, an internal medicine professor at the University of Virginia, pathogens are more easily spread from person to person due to the density of people living on college campuses. It’s more than likely that you have used prescription antibiotics at least once; perhaps you recently went to Searle to fight the Winter Quarter Plague. However, new research by Feinberg professor Jeffrey Linder, Harvard professor Michael Fischer and University of Michigan professor Kao-Ping Chua reveals that the antibiotics you take may not be appropriate for the diagnosis. The study found that only 13 percent of antibiotic prescriptions were confirmed to be appropriate. In the context of the study, appropriate means that antibiotics were not always used in that particular diagnosis. Worse yet, 23 percent of prescriptions were found to be inappropriate. The study’s methods were uniquely comprehensive. Whereas in most previous studies, the appropriateness of antibiotic prescriptions for only specific diseases such as pneumonia was analyzed, this study had a far broader scope. The outpatient antibiotic prescriptions of 19.2 million patients were collected and analyzed based on the appropriateness of antibiotic use for each of all 91,738 diagnostic codes in the ICD-10, which serves as the international guide and codebook for classifying diseases and morbidities. The findings of the study are important in the fight against antibiotic resistance – when the drugs meant to kill bacteria and fungi that cause diseases such as staph infection no longer work. This is often the result of mutations in some bacteria and fungi that spread to the rest of the population since these bacteria have an evolutionary advantage against bacteria and fungi that are killed by antibiotics. Improper use of antibiotics accelerates this process, and makes infections more dangerous. 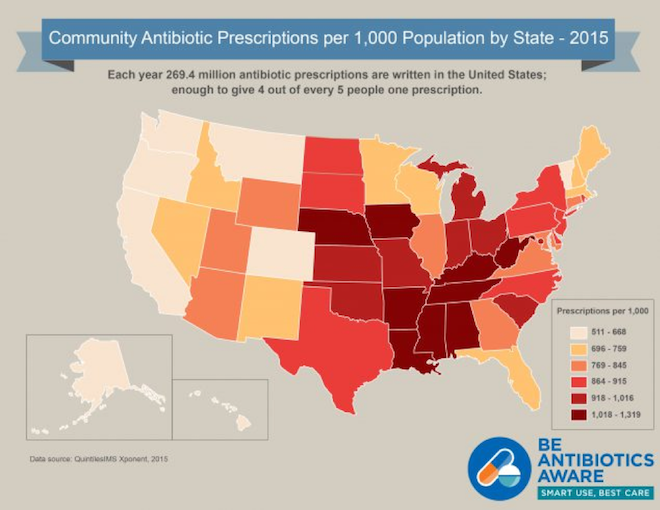 Every year, two million people are infected with antibiotic-resistant bacteria in the US, with 23,000 deaths. While physicians are often able to prescribe other antibiotics when one prescription is not working, some diseases have become totally resistant to nearly all antibiotics, such as gonorrhea. The development of new antibiotics to replace the ones that are now ineffective has slowed significantly due to a lack of research and development by pharmaceutical companies, leaving physicians with fewer options and patients with more risks. Professor Linder’s study is critical for mapping out where misuse of antibiotics occurs. In addition, the study’s results can be used by other researchers to analyze the ICD-10 and the way doctors interact with it. In the study, almost 30 percent of patients were not diagnosed with any ICD-10 code at all, so the rate of inappropriate antibiotic prescriptions could be even higher than these data found. The dangers for college students with antibiotic resistant infections are already emerging due to diseases like gonorrhea. This crisis is not limited in scope to more vulnerable populations – it will affect us all. While the findings by Professor Linder suggest that antibiotics can and will be inappropriately prescribed to you, it is critical that you follow the recommendations of your physician. Systematic change with respect to how prescriptions are given to patients is the responsibility of qualified medical professionals. Do your part to raise awareness for antibiotic resistance, but don’t risk your health.